This was an easy Christmas card I made for a giveaway. 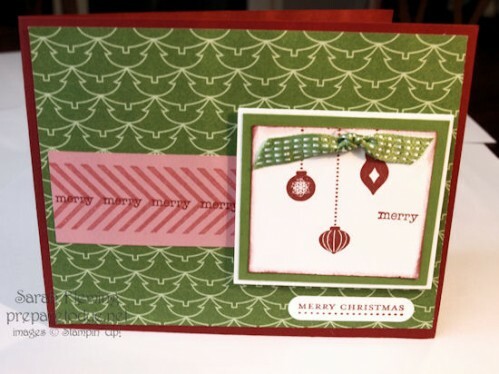 I used a layout from a card we made at stamp camp a few months ago. I’m actually not in love with the designer paper here, but I didn’t have any Very Vanilla cardstock yet, and this was one of the only papers in my Be of Good Cheer paper that didn’t have any VV in it. After I put it on the card, the paper kind of grew on me, so I just needed to give it a chance.